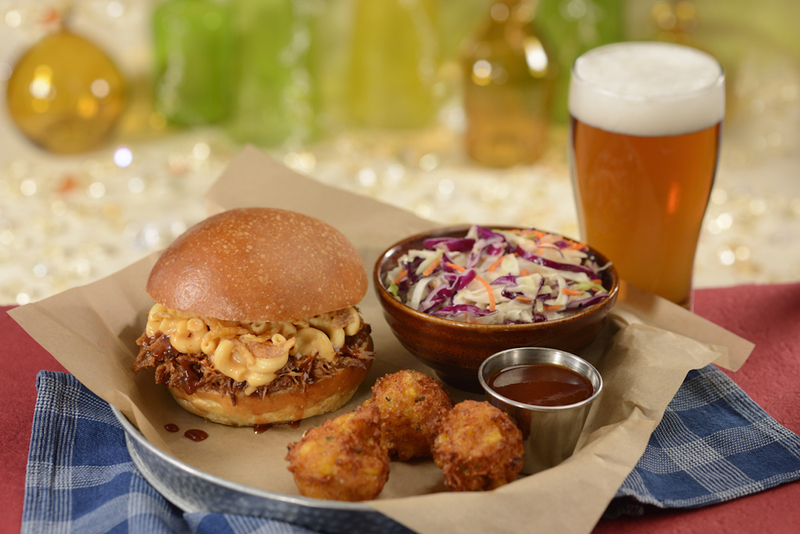 Starting May 23, a new menu will be available at The Diamond Horseshoe in the Magic Kingdom. Guests can enjoy an a la carte menu or platters. The a la carte menu will include a Carved Beef Brisket Sandwich, Creamy Turkey Salad Sandwich, Grilled Chicken Thigh Sandwich with BBQ mayo, BBQ Pulled Pork Sandwich, or Mac and Cheese with bbq pulled pork, crispy onions, and green onions. Platters include Carved Beef Brisket Platter, Smoked BBQ Pulled Pork Platter, Grilled Chicken Thighs Platter, or a Vegetable Platter. All are served with two sides and cornbread. New side dishes include: Potato Salad with grilled onions and a serrano dressing; Creamy Coleslaw with red and green cabbage; Jalapeno Cheddar Corn Bread with honey chipotle butter; Mac and Cheese; Corn on the Cobb with cheese Corn Fritters paprika, lime, and cilantro; and BBQ Baked Beans. There’s also a House Salad or Watermelon Salad. There’s also an all-you-can-eat platter featuring an appetizer, entree, and dessert if you’re really hungry. New dessert options are: Buttermilk Chocolate Cake with bourbon glaze; Peaches and Cream Cheesecake with streusel topping; and a Blueberry Cobbler with lemon and mint cream and oat topping. The Diamond Horseshoe will also be serving beer and wine for guests 21 and older. This new menu debuts May 23 at The Diamond Horseshoe. The restaurant is open from 1 p.m. until 7 p.m.